Focusing on different kind of problems that affect people, Yang She Wei questions life circumstances that lead us to have certain expectations from the others. During the times when the world seems preoccupied with countless relevant and irrelevant information, others’ issues and global problems, the identity of individual becomes unnoticed. People get used to being guided by their own prejudices, not having time to think about things they see. The artist explores the narratives behind the visual, encouraging the viewer to find the truth hidden in the deeper meaning. 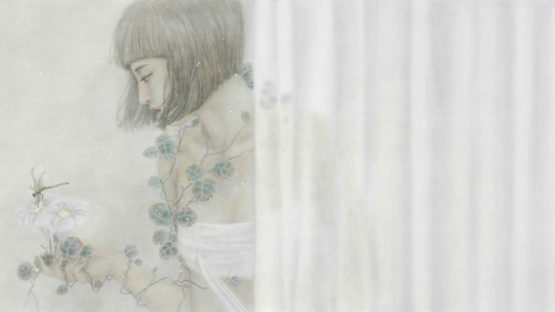 Yang She Wei is born in 1971. He graduated with Bachelor of Fine Arts from Hubei Institute of Fine Arts and with Master of Fine Arts from Xu Beihong Art College of the Renmin University of China in 1995. 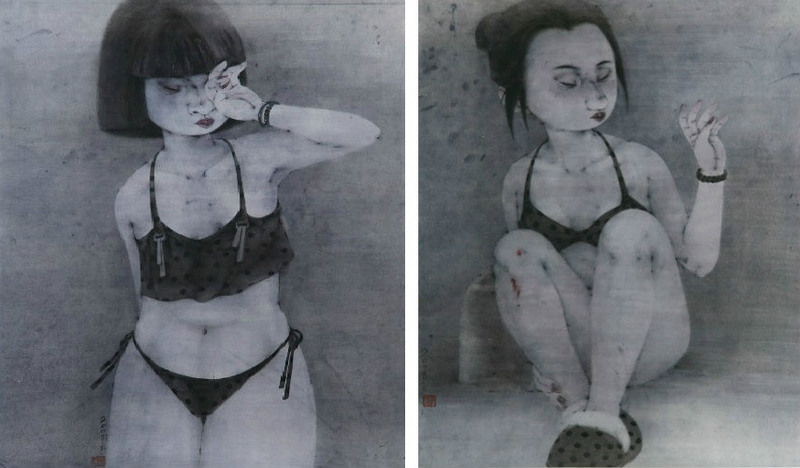 Connecting traditional and modern, he uses China ink and color on rice paper to depict contemporary themes full of content and questions. Have the women become the victims of their own fight for emancipation? They are in a constant struggle to achieve something, from education and gainful employment to perfect partner and normal family, often losing their own individuality, bringing the bitterness in everything they do. Wei’s Bikini series explores the negative effect of social expectations and pressure for woman to constantly strives for more. The same vulnerability is seen on the faces of his characters from the Opera series, where the artist puts an accent on their expressions beneath the masks. He tried to point out the situation of the Chinese opera singers who are sometimes forced to play several roles at the same time. Instead of glorious and respectable persons they should be, these performers work hard for little money and insufficiently recognition in today’s world. 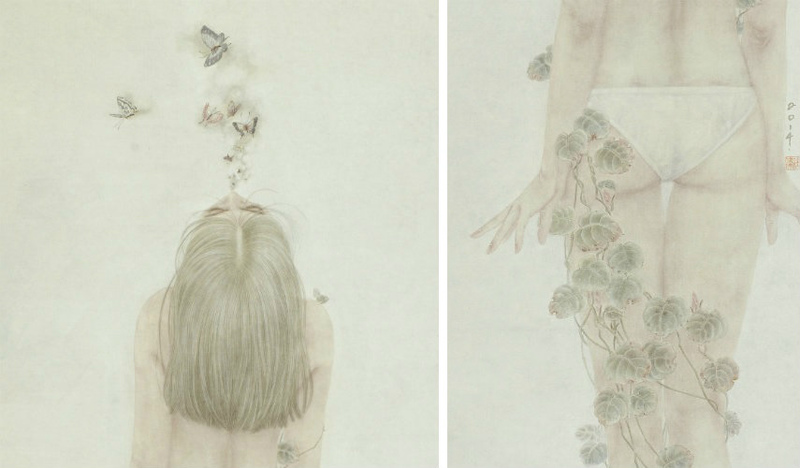 Discussing the ever-present dilemmas in the modern, urban lives, Wei’s works reveal raw emotion of his subjects through the masterful use of ink and color technique. He has exhibited in couple of solos and numerous group exhibitions and his works are collected by a number of museums and institutions in China including Today Art Museum, Beijing, Sichuan Fine Arts Institute, Chengdu, Guan Shanyue Art Museum, Shenzhen, Hubei Museum of Art, Wuhan and Lingnan Museum of Fine Art, Guangzhou and private collectors in Hong Kong, China and overseas. Yang She Wei lives and works in Beijing.